These are soooo old. You have to plant them before the die. 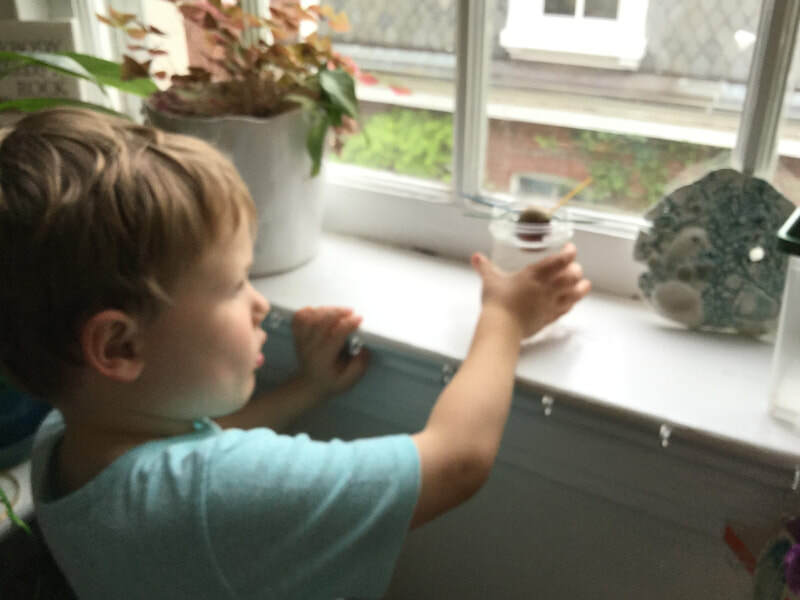 The children looked up how to sprout an avocado seed on the laptop and got all of the necessary supplies, tooth picks, jars, our seeds and a pitcher of water. 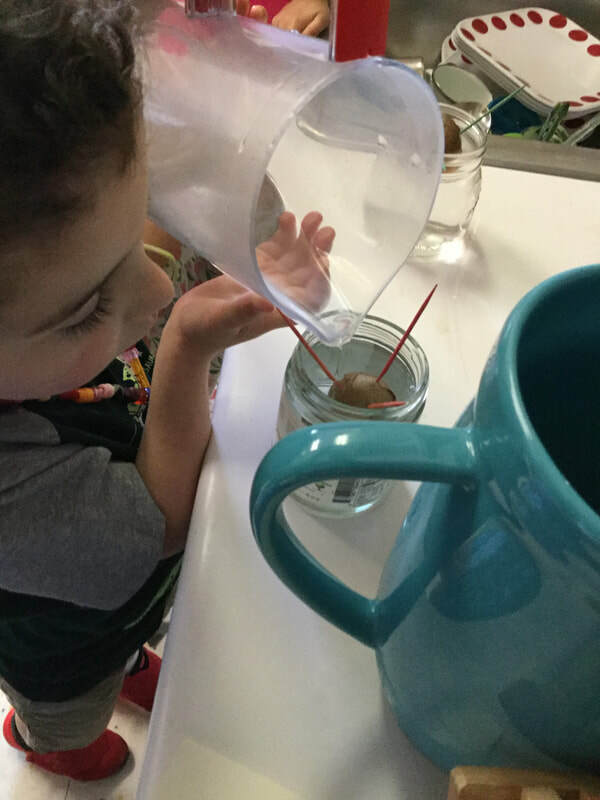 They used the toothpick to suspend the seed in a jar, filled it with water and placed the jar in the window. If we can keep the seeds alive they could fruit when the Rainey’s are in junior high, surely cause for a reunion. Children cleaned fruit off of the stem and peeled off some layers of leaves. Sam collected the leaves and decided to bring them home because they reminded him of pointy petals. 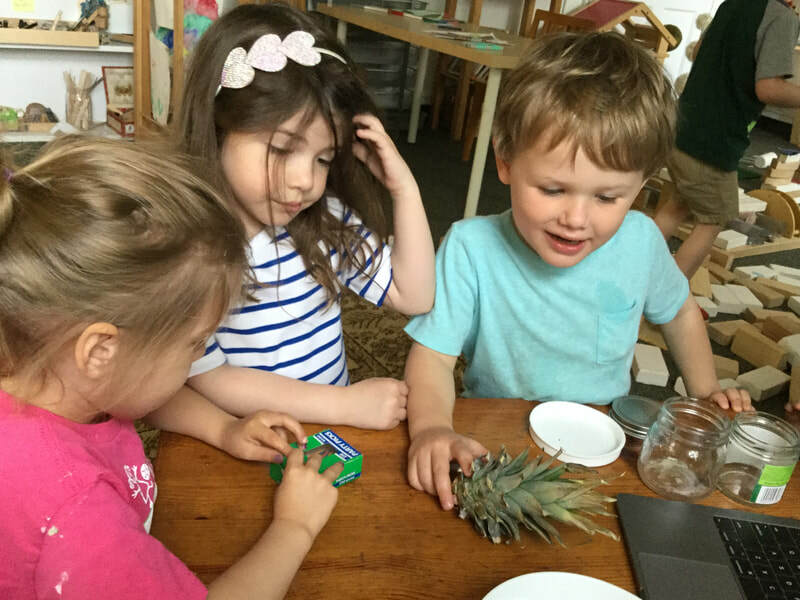 The children noticed tiny holes at the stem of the pineapple, which we learned is where the roots will grow from. The stem will dry out over the weekend and next week we will place it in some dirt. The pineapple plant should produce fruit in one to two years, so maybe we have some fruits of our labor in the Tucker Room next spring! 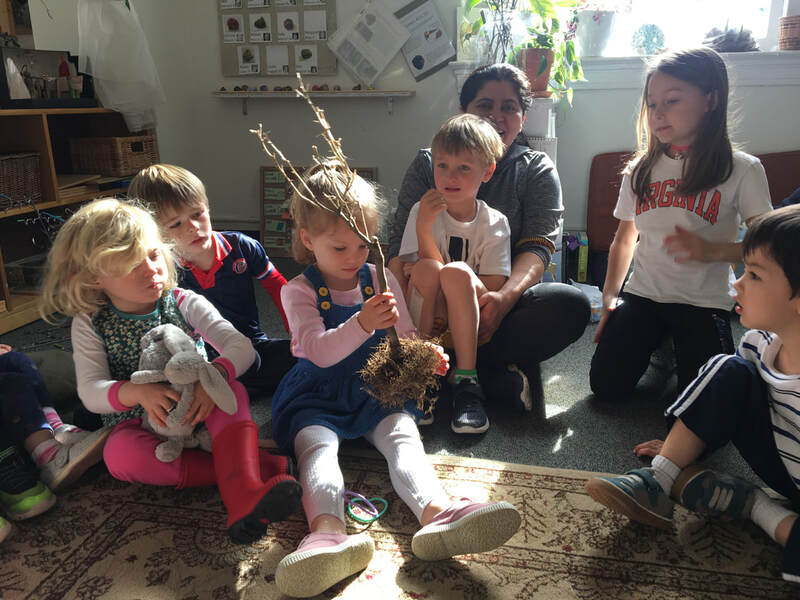 We are so lucky to be spending so much time experimenting with different methods of planting and learning about the different needs of various plants and trees. These connections and practices are helping us become stewards of the earth. Just in time for Earth Day on Monday! A joyous Passover and Happy Easter to everyone! Hello everyone. There will be no blog today due to the ECES presentation. See you tomorrow! ​During morning meeting, Margaret shared a box of treasures she collected during a recent camping trip in the woods. She showed us some rocks that she found, as well as a very unusual stick, and change she collected when she happened upon a trail of coins buried in the dirt in the woods. 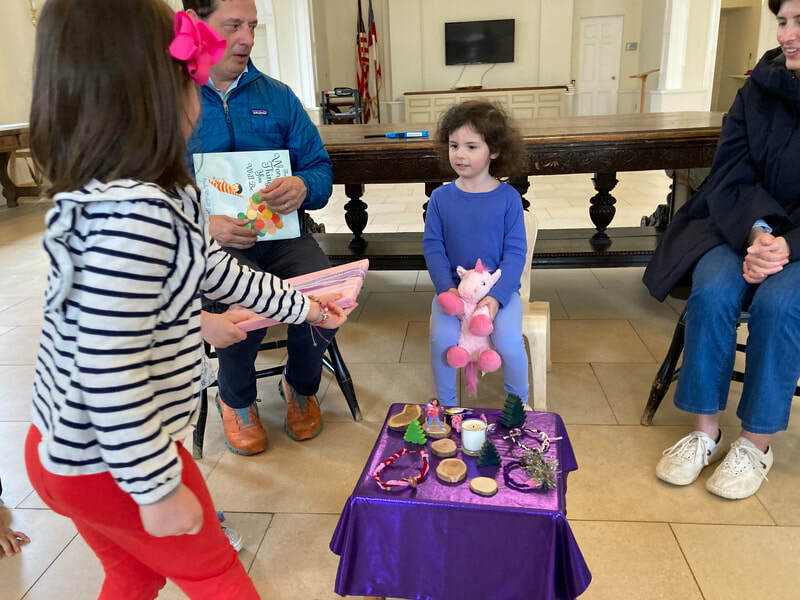 This was Margaret’s first time tent camping, and Rainey Room friends were just as intrigued about her camping experience as they were by the objects she had collected. ​Elle: Did you see the stars and the moon? Margaret: I saw the stars out my window. And Hadley and Campbell were all squishing me. Louise: Did you see a rainbow? Margaret: No, it didn’t rain during my camping. Grace: Did you sleep with a pillow and have a blankie? Margaret: I had a new sleeping bag. I didn’t have a chair for camping so my mom buyed one. Elle: Did you see bugs? Jack: Did you see insects? Lou Lou: Did you see deers? Louise: Did you see magic? Margaret did not see bugs, insects, or magic. But she did see deers. She also went to Yoder’s to feed the animals. While they were there, her sister tried to catch a bunny and they saw a pig holding a seashell. Wow, what an adventure! 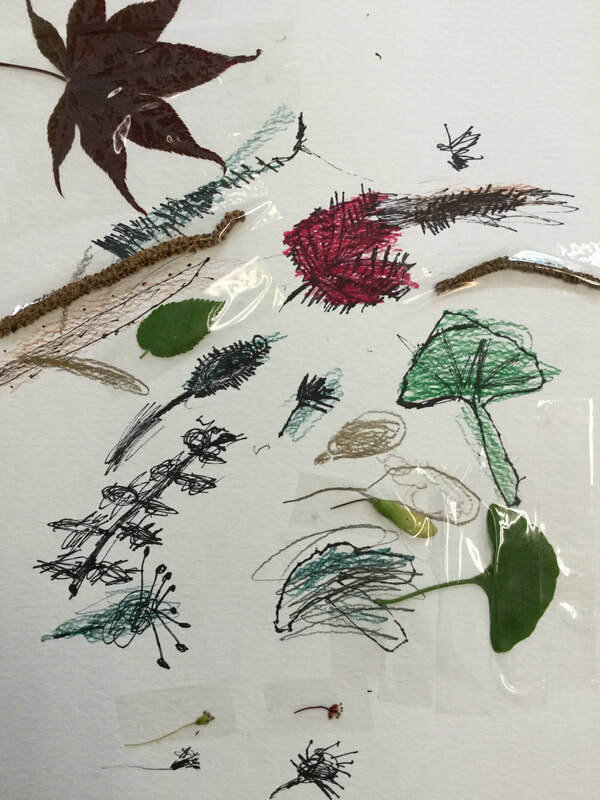 ​Later in the studio, Leigh and Sally continued our exploration of spring trees by closely observing and drawing specimens we've been collecting--including seeds, catkins, baby leaves, as well as some things we've yet to name. 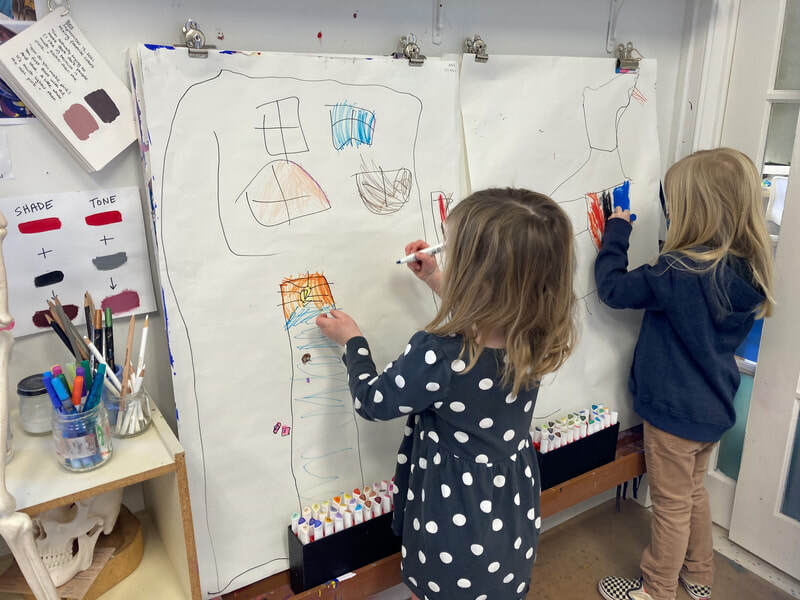 Working with Rachael, they created a game in which each of them selected something for the other to draw. 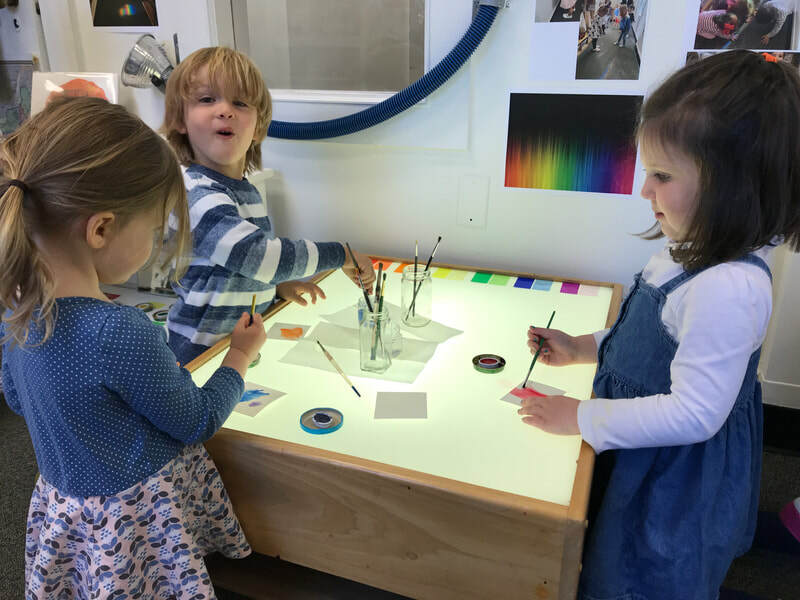 They had a great time, learned a lot about the beautiful objects hanging above our heads and falling all around us, and produced amazing detailed drawings. 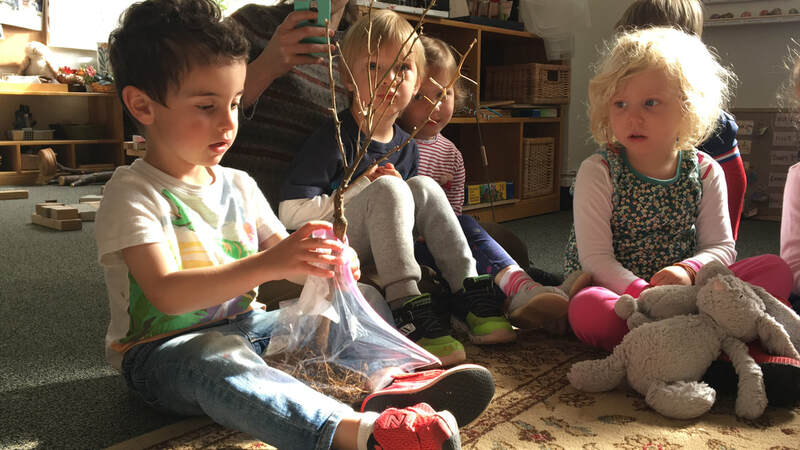 The children have been noticing the smallest parts of trees and have been eager to bring them into the Rainey Room to share. Today, Louise brought in catkins she found a walk. 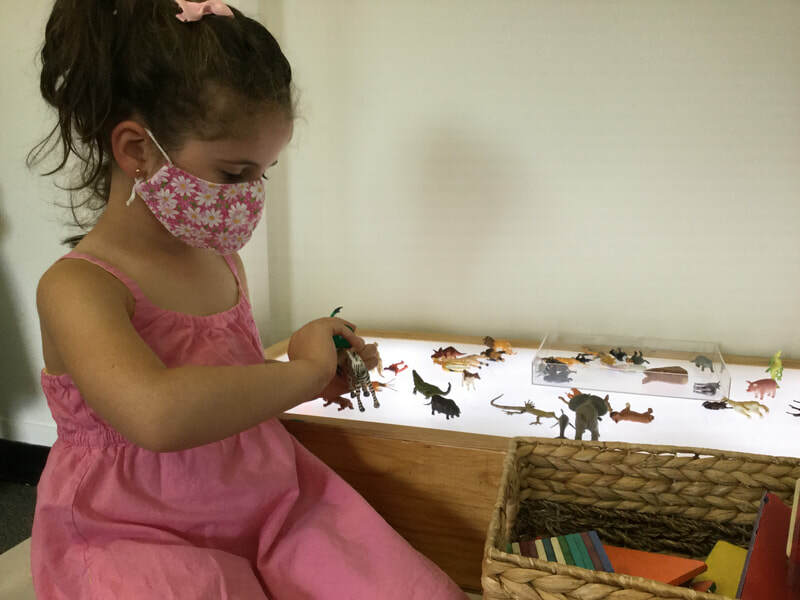 Her finding sparked a conversation about pollen and some of our favorite insects, butterflies and bees. 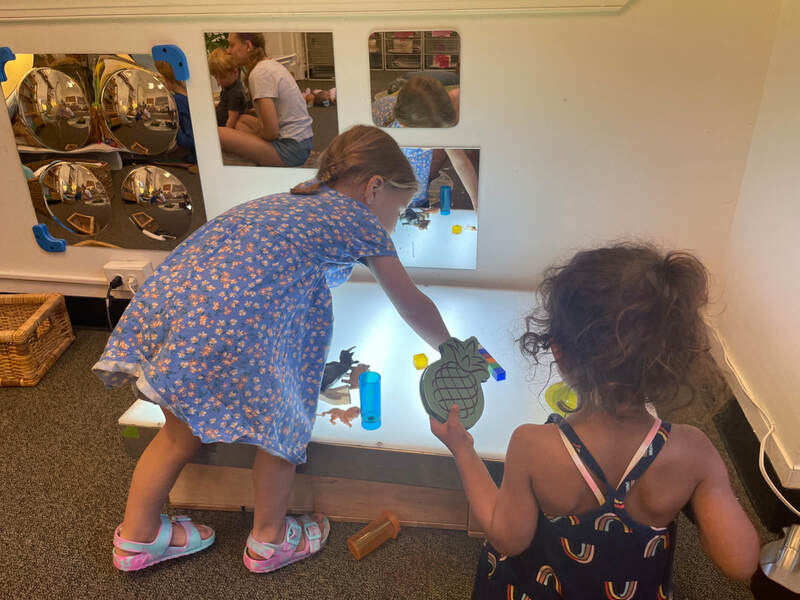 As the year progresses, we have observed the children are making more connections in their conversations and notice how interconnected our world is. Margaret: I just know its pollen cause my mommy tells me pollen is shaped like this. Its something that makes some people sneeze. It makes my sister Hadley and my mom sneeze. Sally: You know butterflies like pollen. Because they get nectar. Rowan: And also honeybees give lavender to flowers. Lisa: How do they make honey? Jack: They drink the nectar and then they turn it into honey. Leigh: Bees make flowers out of honey. Austin: Pollen is yellow. I saw pollen on the street. Elle: Pollen comes from trees and it falls down from trees and its all here at the start of the spring and then it falls off. And then it turns into flowers. And then when you pick it up it in a bag it turns into (rot?) it turns into brown. 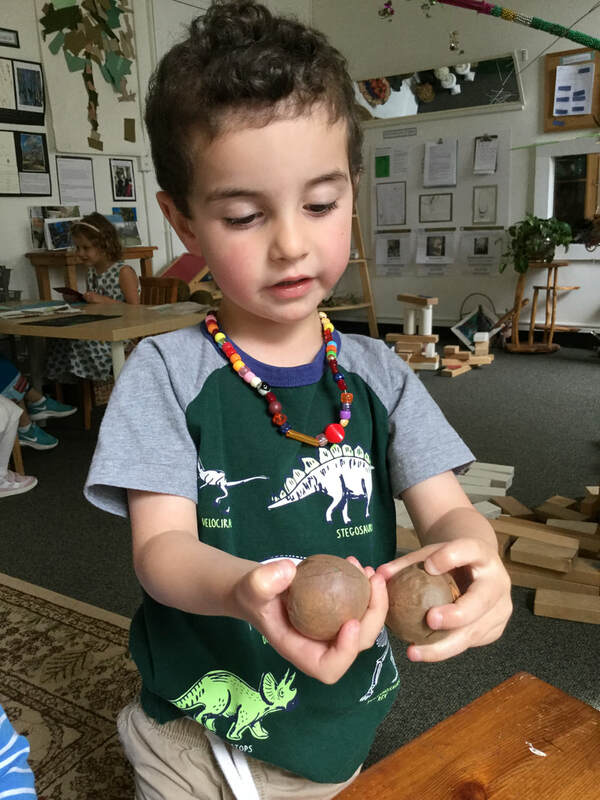 This week, Sam brought in a small lemon tree he found recently while digging in his yard. This morning, he shared it at meeting, explaining to the class why he found it fascinating. 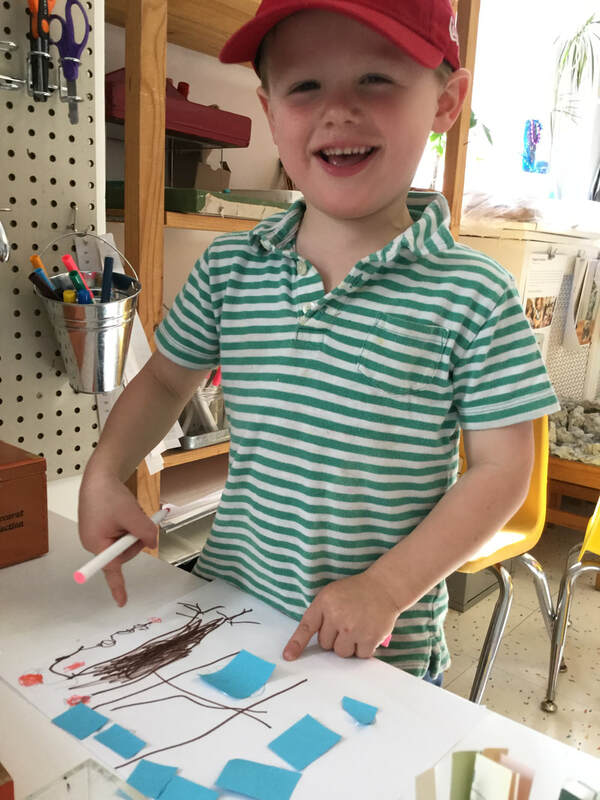 When we passed it around, Kian noticed , "The points are super pointy." Sam mentioned that when he found the tree it had one leaf left, but it has since fallen off. We wondered why it had died, and Sam said he thought "Because it was so so so so old." We asked if anyone had thoughts on that. Austin: Trees live longer than humans. Lisa: What do we know about old trees? 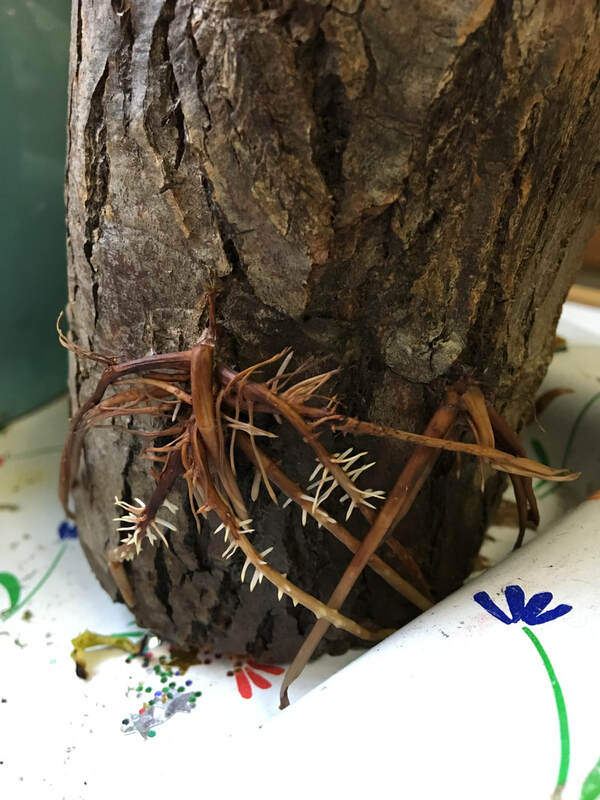 ​We continued to think about what may have caused the tree's death. Hilary told the group that she and jack learned recently that fruit trees need a lot of sunlight. 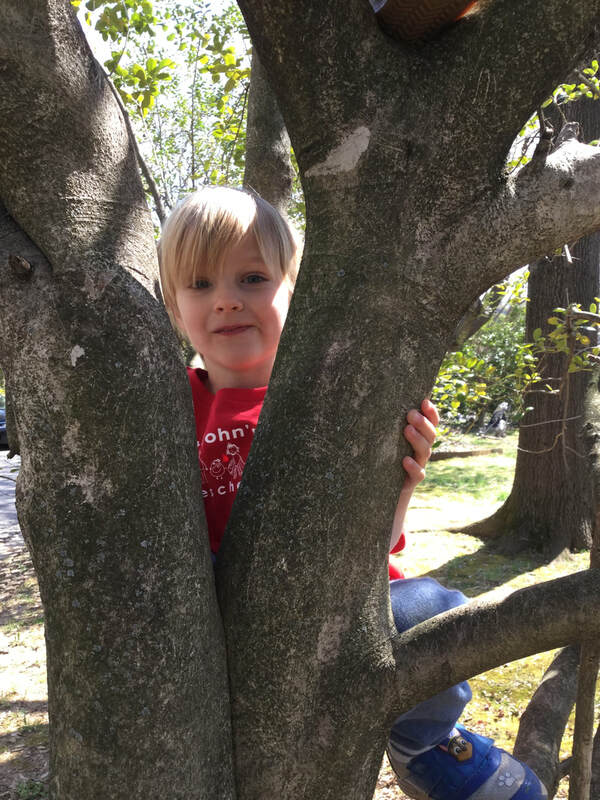 Will observed, "If the fruit trees take the sun, the other trees can't get it"--an important lesson from one of our storybooks about trees blocking the sunlight in order to take it all for themselves. Katherine asked Sam if his lemon tree had been planted in the sun. Sam said that it was in the shade of another tree. Ah-ha! A clue about the tree's demise. We went on from there to talk about how the tree had lived alone without any family around. Will suggested we try to find other trees to give it a family. Jossie suggested we dig a hole and put it back in the ground. Austin suggested that we put it in a pot and try to bring it back to life. Will made the comment that trees can't talk. This reminded us of something that one of our tree experts told us: trees do communicate with each other, and they can sing and send signals to each other. Can they talk to us? If they did could we hear them? Is it possible they are sending us signals too? Could we feel what they are telling us if we can't hear them. 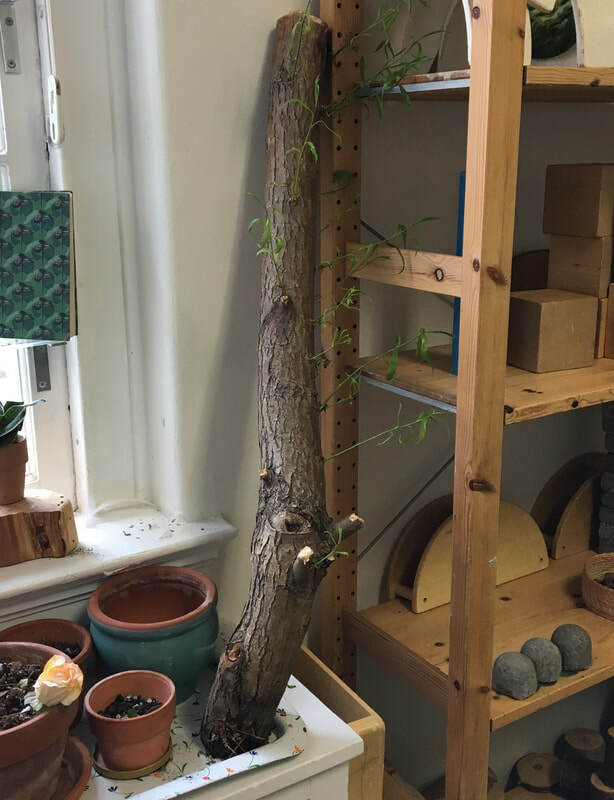 This discussion about bringing the tree back to life reminded us of the willow branch that's been growing shoots and roots right in our classroom. Rachael told us that willow bark can be used to make "willow water," which can help other plants root! Maybe it could help us with some of our fruit cuttings and seeds. The children recalled seeing the big willow tree (from which the branch was cut) in Austin's yard last fall. 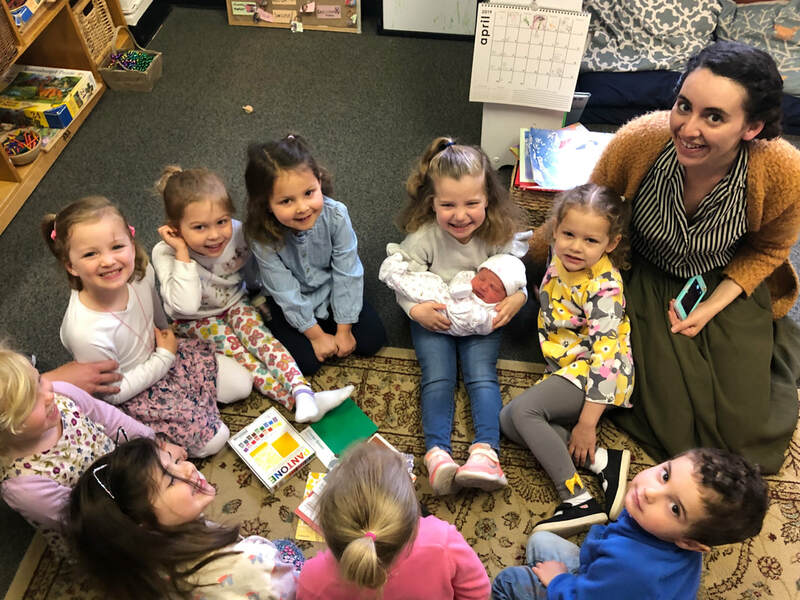 If our baby willow is going to get that big, it clearly can't stay in the classroom, or as Grace observed, "It will break the ceiling." We're going to have to find this willow tree a new home! Wow. Lots to explore, lots to learn, and lots to do! Have a wonderful weekend and rest up! ​Thank you for joining us last night and participating in our branch building. The children were amazed at your work and will surely have questions for you. At meeting we looked at pictures from last night and a video of your reactions to the movie. 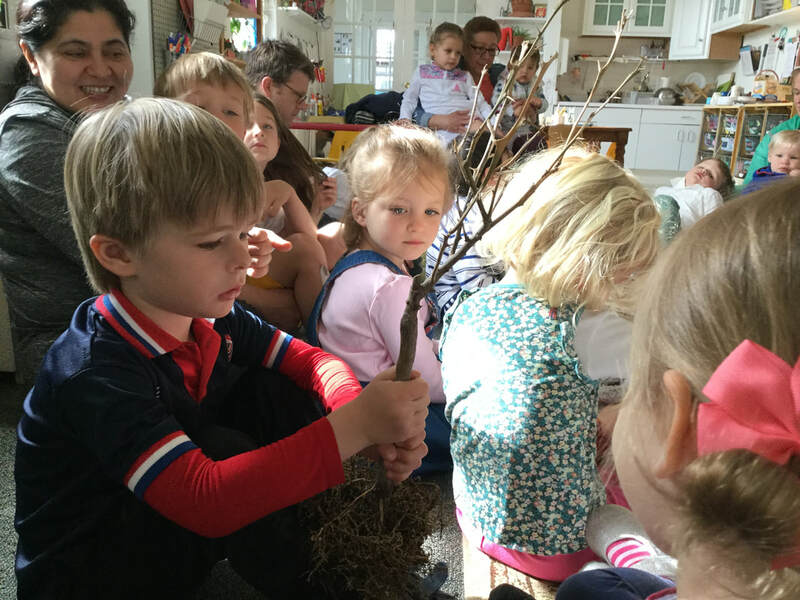 They loved the ways our tree grew overnight and are eager to build upon the branches you helped construct. 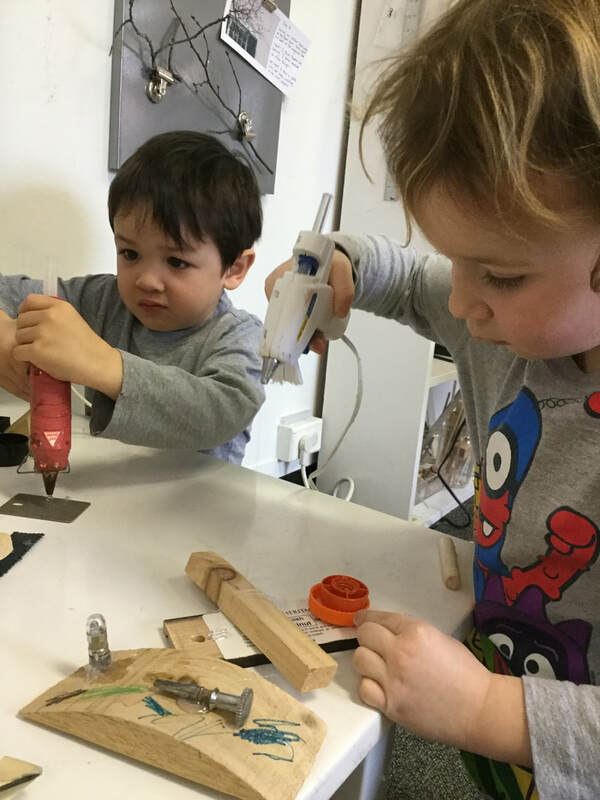 We were all so impressed, thank you for diving in and embracing the St John’s maker spirit! 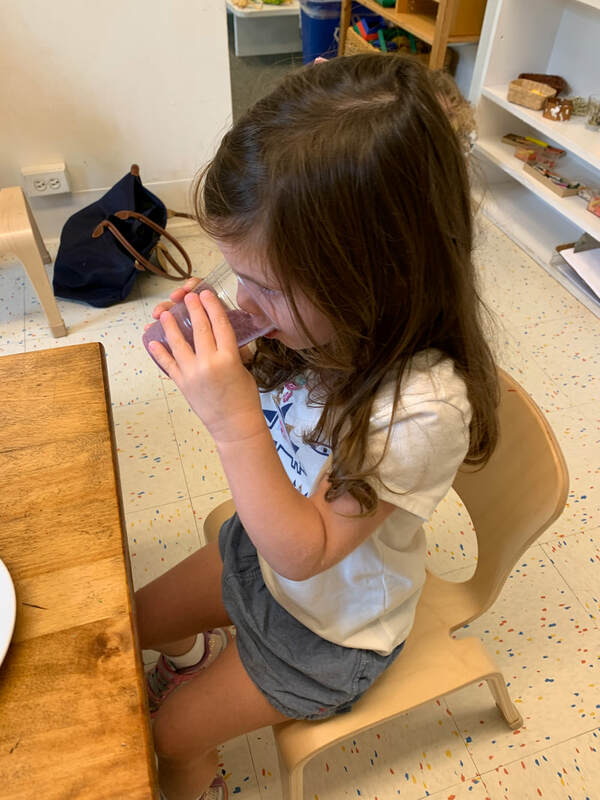 The children are interested in small creatures, especially ones that come into our house or have maybe even built their home inside of our homes. 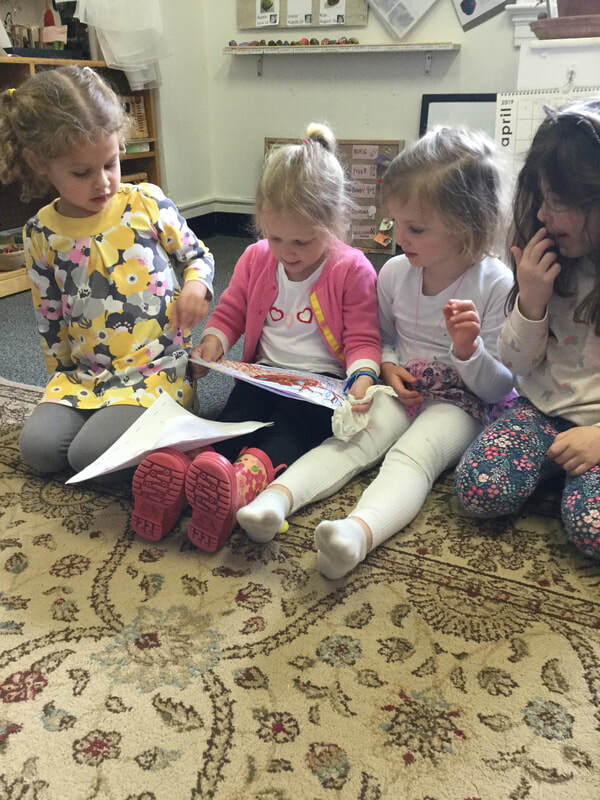 The children shared stories about ant, mice and raccoons. They are thinking through the desire to keep their space critter free but many also consider not hurting the animals. They devised plans to lure the animals into boxes with cheese and peanut butter and then let them go outside. Or only giving them things they don’t enjoy, like cinnamon. 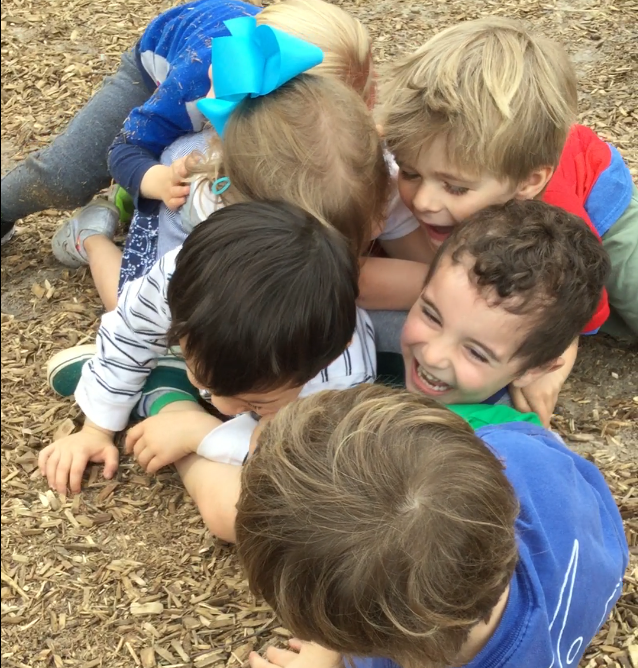 On the playground today, we found a worm and an ant. 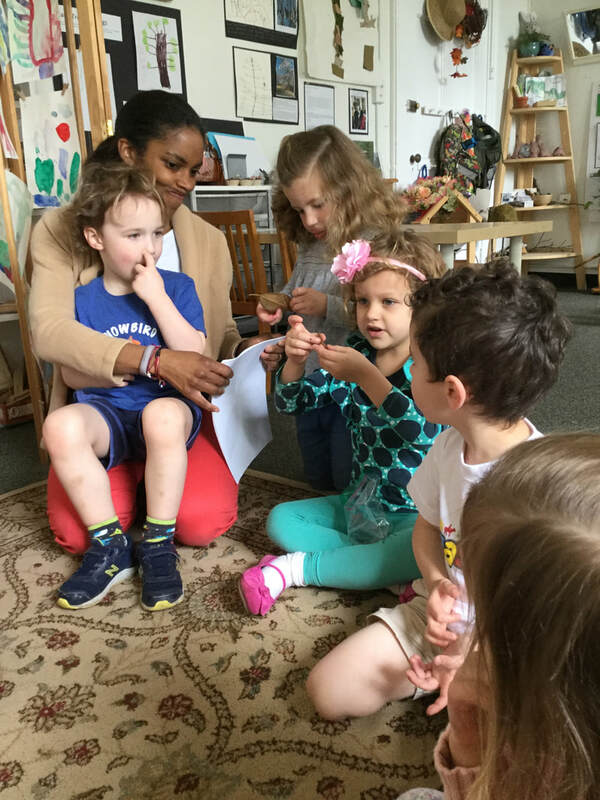 The children were eager to share their new tiny friends with their Rainey room friends. We spent most of this beautiful spring day in the outdoor classroom. The morning was full of new adventures, physical challenges, and affection. 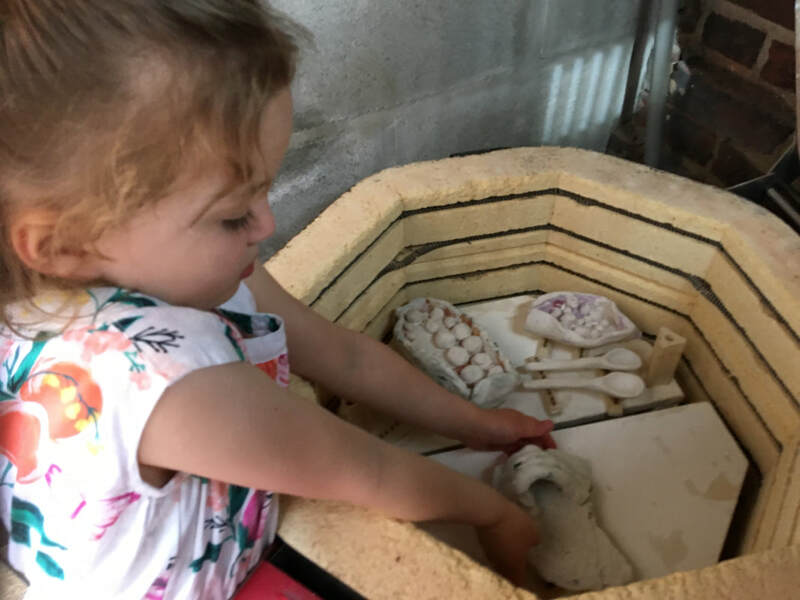 Jossie learned how to load the kiln. Leigh and Louise threw a party for all their friends at which they only pretended to eat the hand soap. 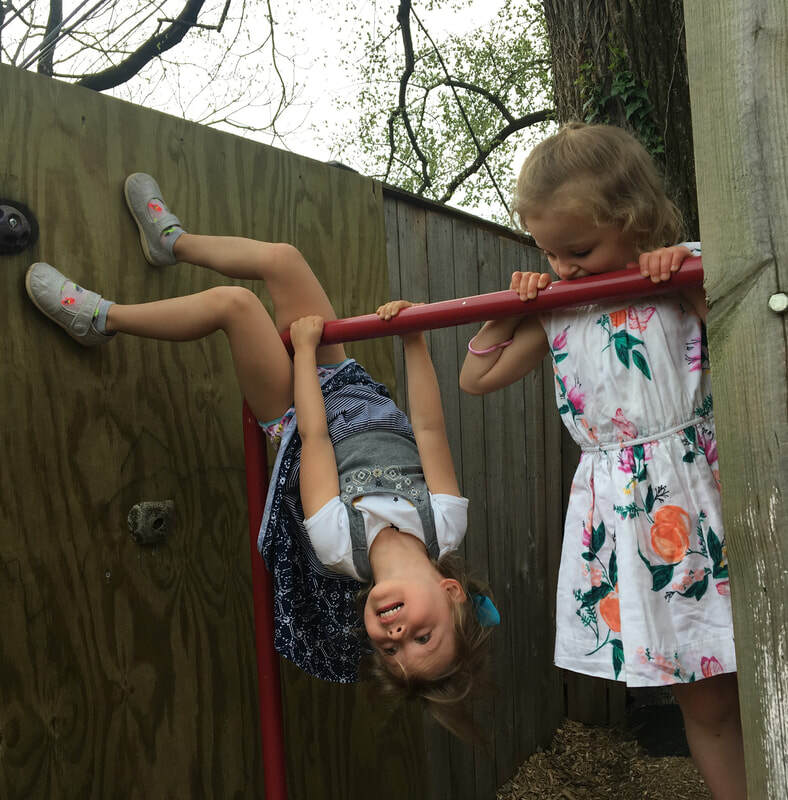 Elle did new tricks on the monkey bar. 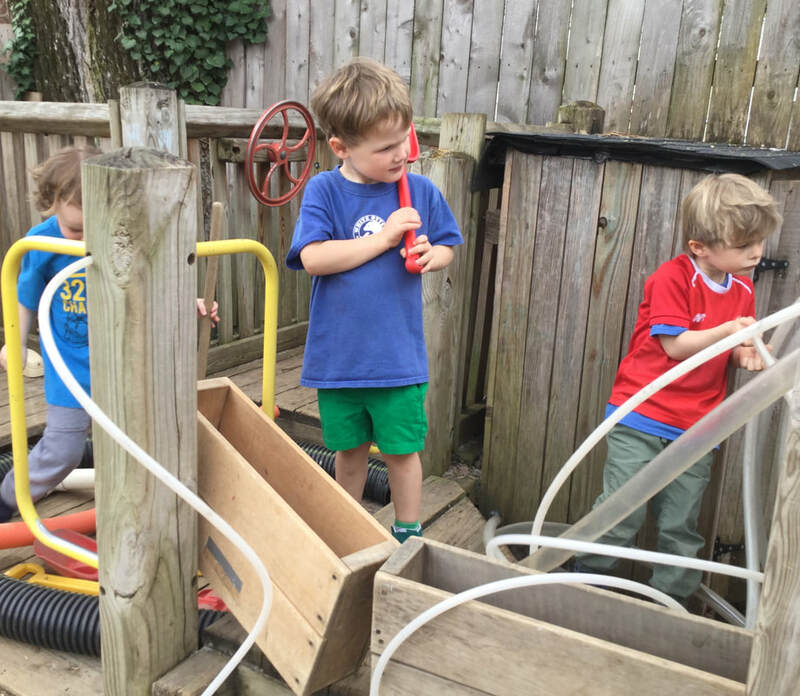 A few friends devised new games and skill tests using the play structure, then later invented a full-contact game that started with a group hug and progressed into a big squirming pile of giggling children covered in mulch. They played many, many rounds of this game. Last week, we put a moratorium on tree climbing in the outdoor classroom due to concerns about children's safety and the health of the trees. 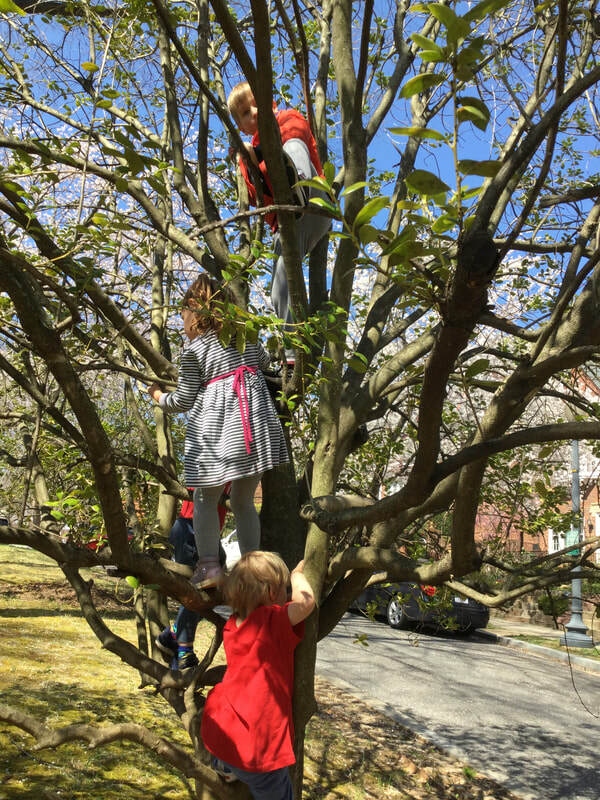 Today, some children examined the evidence of years of tree climbing--lots of bark rubbed smooth and scratches and nicks in the trunks. They talked about how we can help the tree recover. Lou Lou suggested we put band aids on the tree. 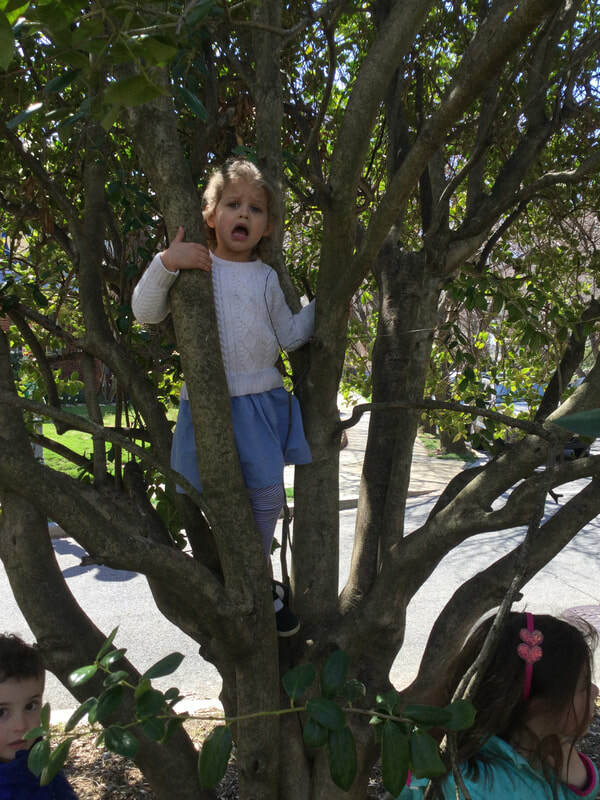 Leigh was concerned that band aids might hurt the tree's bark, and suggested they kiss the tree. At the end we enjoyed a hard-earned snack in the fresh air, surrounded by our human friends and our tree friends. 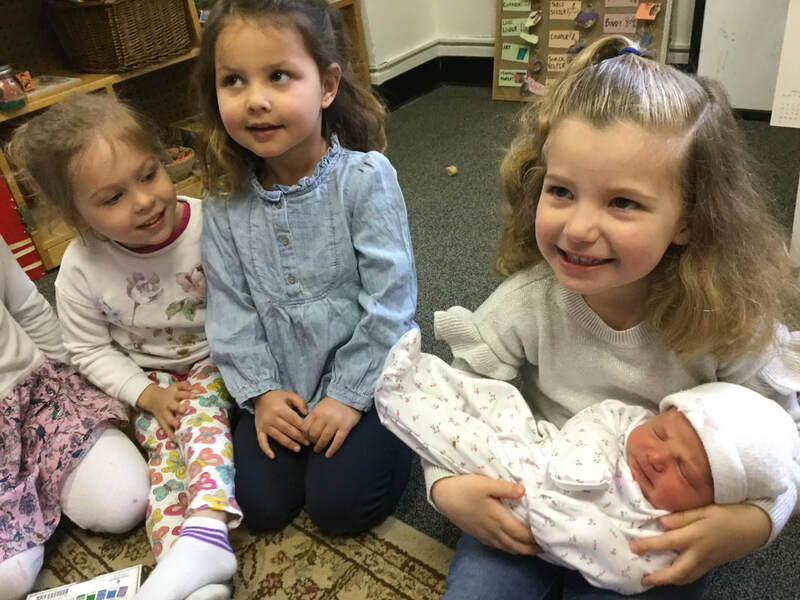 All week, Leigh, has been sharing stories about her new baby sister Isabelle and today we got to meet her! Jessie and Louis brought in the newest member of the Sterchi clan and we fell in love. 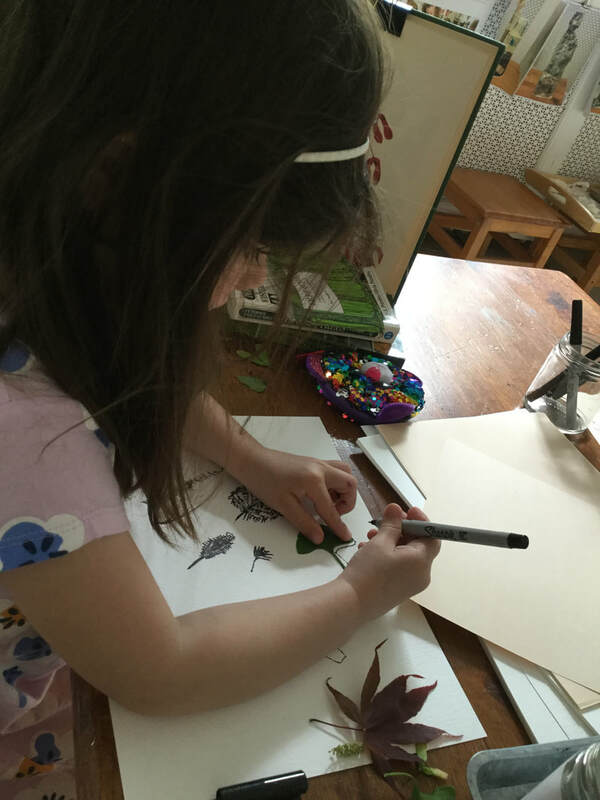 Sally made a collage for Isabelle and all day the children had questions about exactly what Isabelle likes to do with her time. It turns out she likes to sleep and eat. What a life! Thank you Jessie and Louis for sharing these sweet peas with us. We can shake the tree and get the leaves off and glue them back. Kian: But those will be old leaves. Grace: We can go to a leaves store. Jossie: We can water the tree. Sam: I’m gonna plant a tree! Leigh: Maybe we can give the tree some of our stuff. Maybe flowers. We can glue them. Lulu: I think it would like its old branch that falls down. If the tree wants it back, it can have it back. Austin: Cut the limbs. They might be long. Jack: Cut the ivy off. Elle: Give the tree a card. It can say I love the tree and have a heart on it. Charlie: We can give it lucky coins and cookies! We missed Lisa today but know she is having a wonderful time in New Orleans and were thrilled to spend some quality time with Jennie. 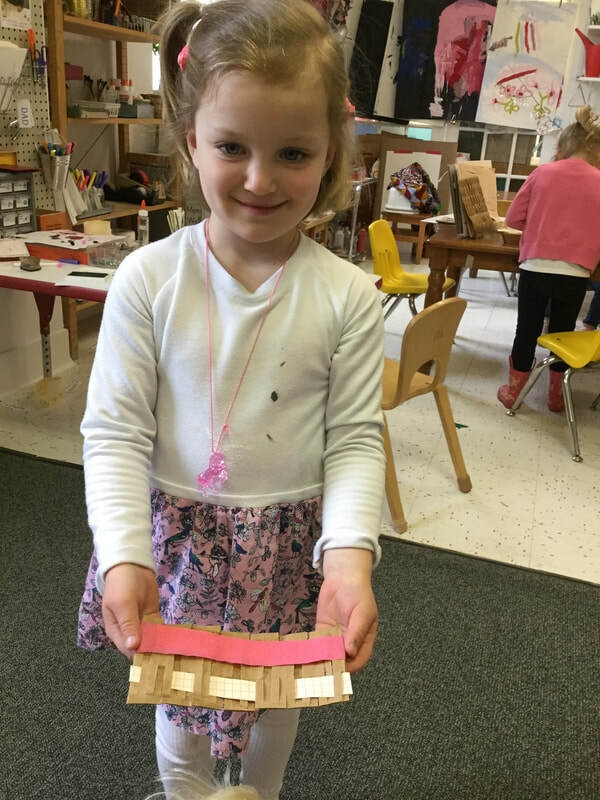 Today, friends explored paper weaving, construction with loose parts, legos, drawing and more. 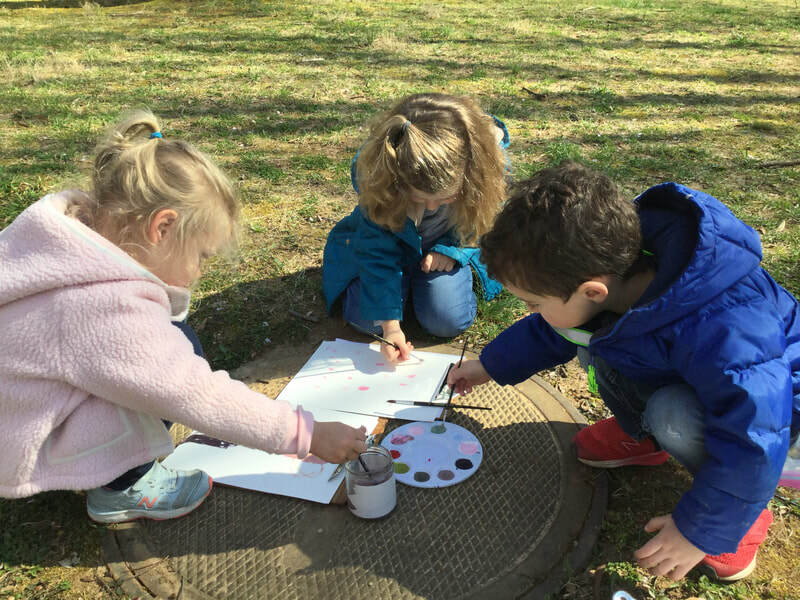 Yesterday Austin and Jen talked about how they "Bring the flowers onto the pictures," using cherry blossoms in our drawings by adhering them to a drawing or painting. This morning at meeting, Austin reminded us of this plan and said he’d like to figure out how to do it. Friends were very interested but the challenge is how to collect them? We began to brainstorm. Austin: Wait for them to fall and pick 'em up. ​Will: Should d we get a basket to put them in the basket? Austin: But they will blow away. Will: We could put plastic on the top and put a little hole. Sally: My mommy has a purse but not a basket. I can ask her to get a basket. Lisa: Where will we get them? Does anyone know of a tree with cherry blossoms? Austin: I could catch some. Jack: I have a cherry tree. When we go down our steps we see it and it has flowers on it. Cherry blossoms. Lou Lou: I have one too. Lots of friends have--or know of--a cherry tree they see every day where they can collect cherry blossoms. Some friends have other flowering trees. We can collect those blossoms too. Rachael: If the blossoms fall down. What could happen? Leigh: Someone could step on them and then they will get all mushed up so we can't get them. Louise: Maybe we can't wear shoes. Leigh: But what if our feet get dirty. Louise: We can wipe them off with towels. Leigh: But what if we step in mud, or dog poop? We continued problem solving and got as far as grabbing the blossoms before they fall to the ground. But we after a while we had to put our planning on hold for a snack break. ​Afterward, children were invited to draw pictures of their experiences yesterday, or of their ideas for a cherry blossom catcher. 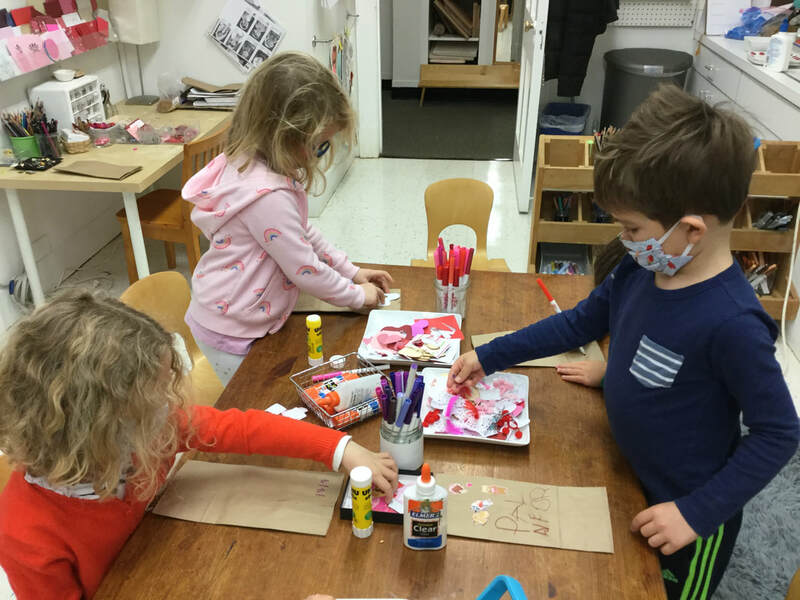 Children talked and exchanged ideas while they worked, but everyone used different materials and expressed their ideas in different ways. They also emphasized different aspects of what they were envisioning, and focused in on different details. ​Jack started with a strong tree with roots, then used blue paper for the color of the sky, and added a few sprays of bright pink blossoms. 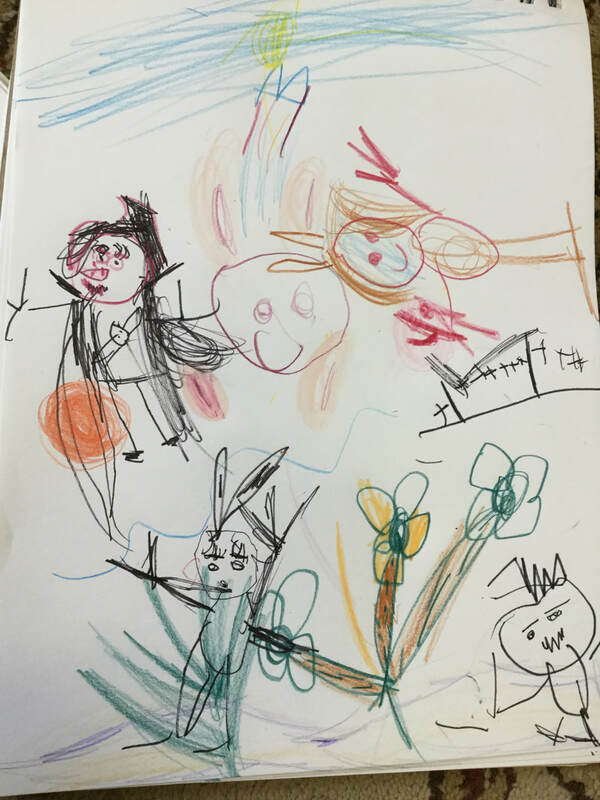 Margaret started with lots and lots lot of blossoms, then added herself to the picture. 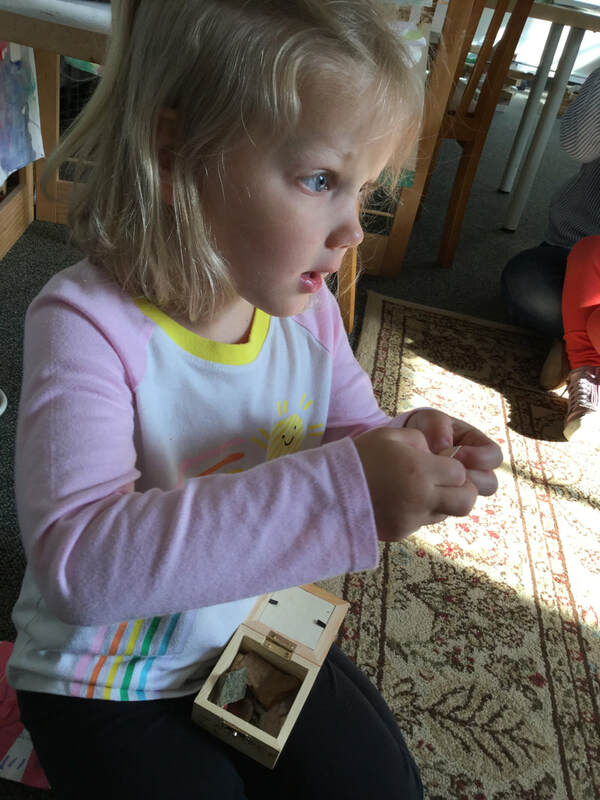 At Tudor Place, the children learned how to use tree rings to learn how old a tree is. Jack applies the same logic to flowers. 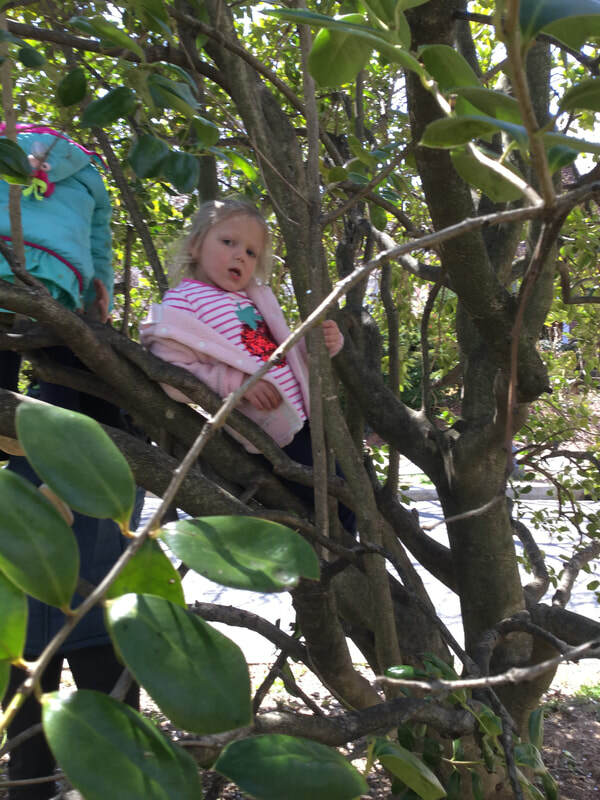 When we first arrived at our island shaded by cherry blossoms, the children ran around, finding sticks, fallen blossoms, “sugar” from the ant mounds and other items of intrigue. The did cart wheels, stared up at the sky and enjoyed a idyllic morning. We gathered on a tarp and talked about thinking about what we want to draw before we even gathered our materials. 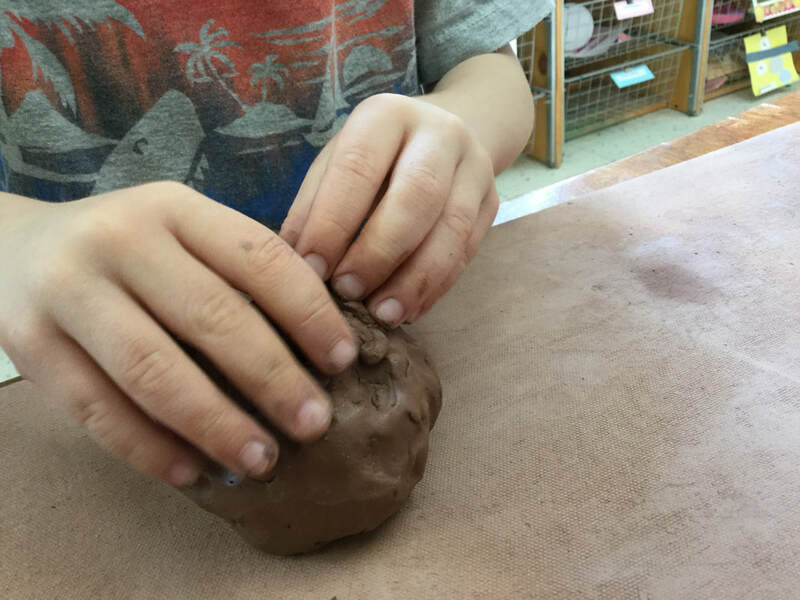 The children shaped their hands like viewfinders and peered through to find the perfect subject. 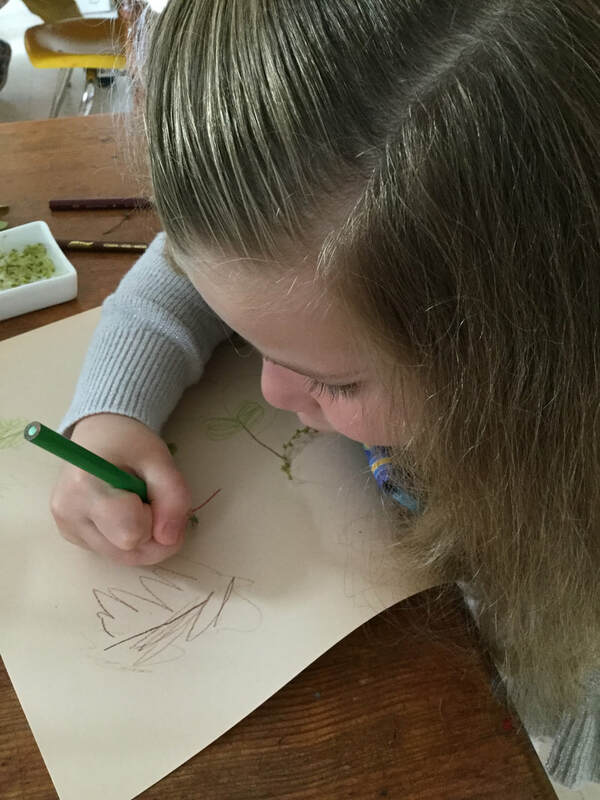 Children are feeling more comfortable in their drawing abilities so more are expressing a desire to draw. A breeze came through, snowing cherry blossom petals and made the children giddy. They were thrilled at the flowers raining down on us and it was beautiful to share in the delights of nature with them. After drawing and painting, their tummies started to rumble so they trickled over for a picnic snack in the shade. 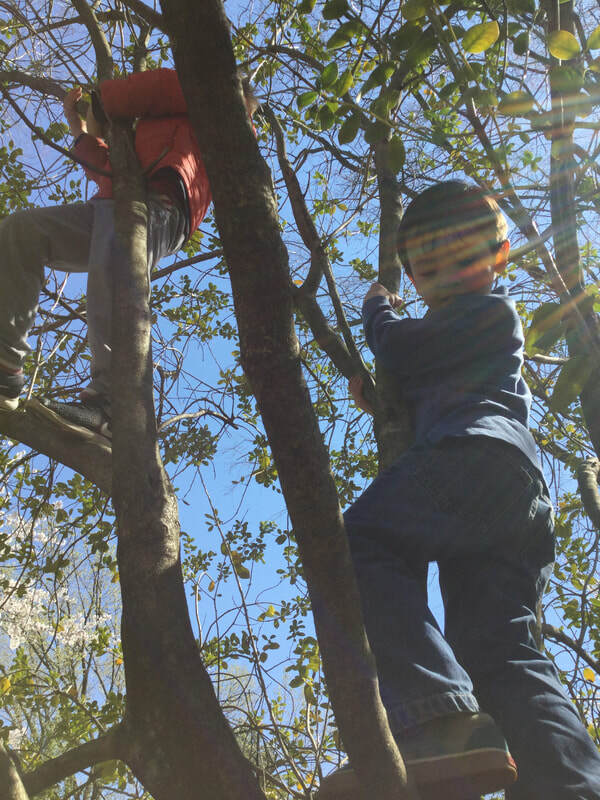 Next the children took to the trees. Literally. 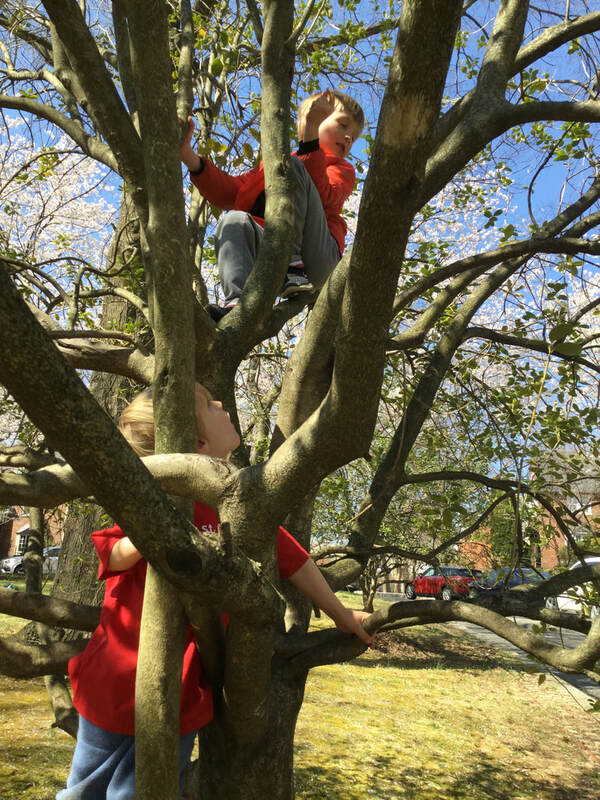 Austin is our seasoned tree climber and he coached Charlie on how to climb the tree. When Grace came over, Charlie coached her. Soon the tree was filled with children, and we talked to them about testing branches before putting their weight on them. ​We have had some pretty amazing field trips this year, but this may have been a personal favorite. The weather was gorgeous. 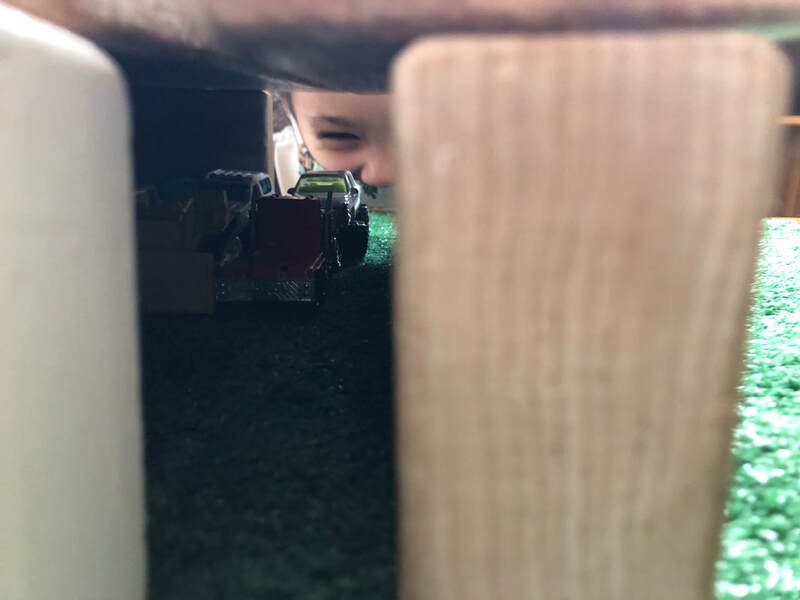 The space was enclosed so the children could find secret hideouts and run around without an adult shadow. They illustrated their experience. But the best part was the children being able to fully interact with their environment. Playing in nature fosters a love and appreciation for nature. Thank you to all of the families and caregivers who helped and spent the day with us. Pieces of Rainey Room experiences.